After our wonderful Christmas at Rebak Camomile and Norsa left the marina on 27th December and headed to Kuah on the main island. 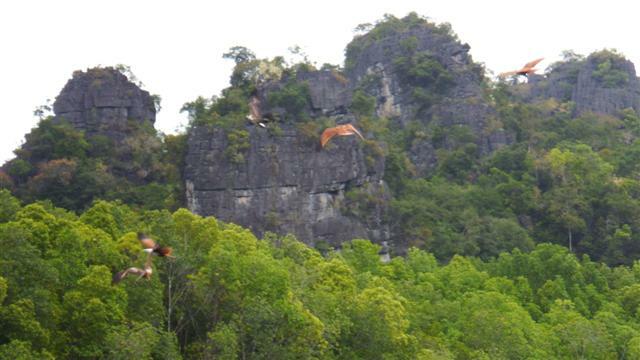 As Langkawi is a duty island we restocked with wine and visited the supermarket before checking out of Malaysia. 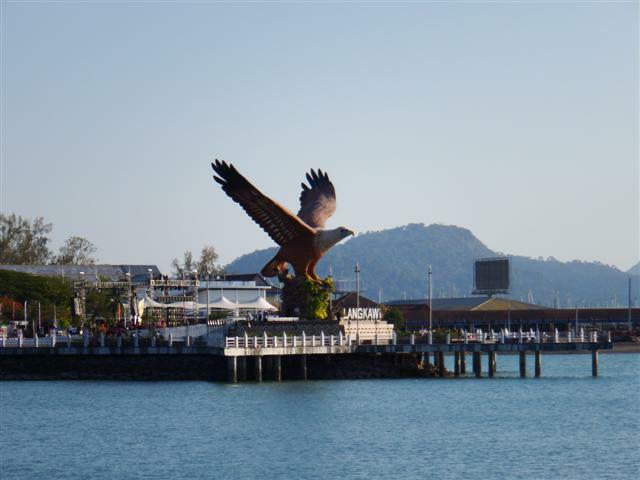 This huge statue of a sea eagle dominates the harbour and is the emblem of Langkawi. 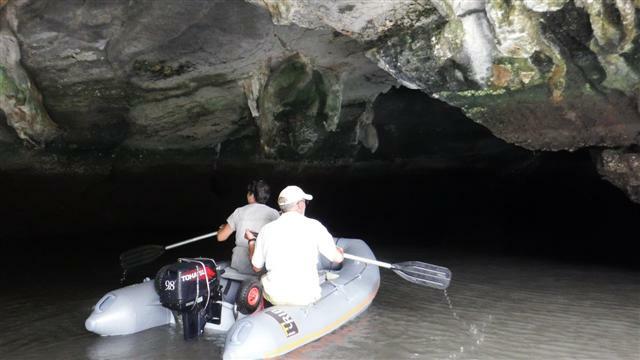 The place to see them is at the ‘Hole in the Wall’ anchorage on the north side of the island so before we headed north to Thailand it was decided that a day or two there would be nice. Langkawi isn’t very big and it only took about 3 hours to motor around. 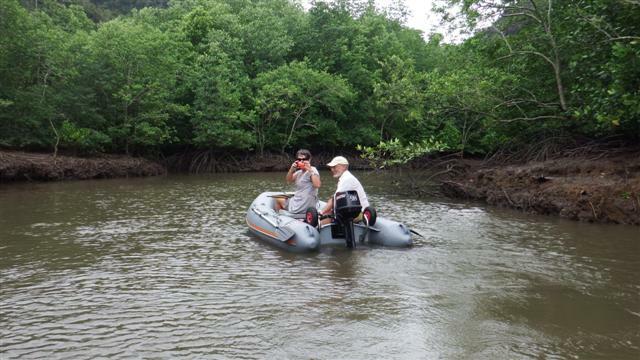 Norman had been having trouble with his new battery management system that Bill had helped him fit in Pangkor so the next morning Bill and Norman spent several hours sorting that out. Just upstream from us there was a ‘crossroads’ in the river. I had noticed quite a lot of tourist boats heading round to the left so Sara and I packed up picnics and the 4 of us set off in 2 dinghies to explore. 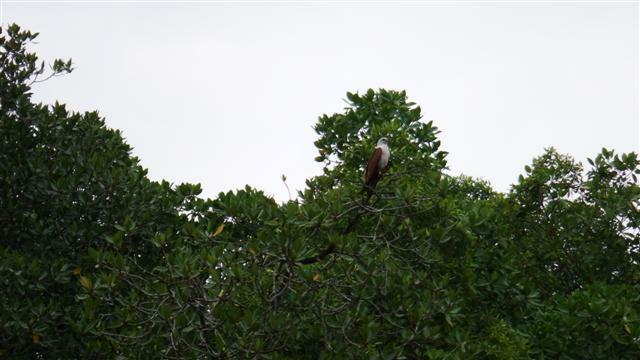 Round to the left we found the sea eagles; there were dozens of them. 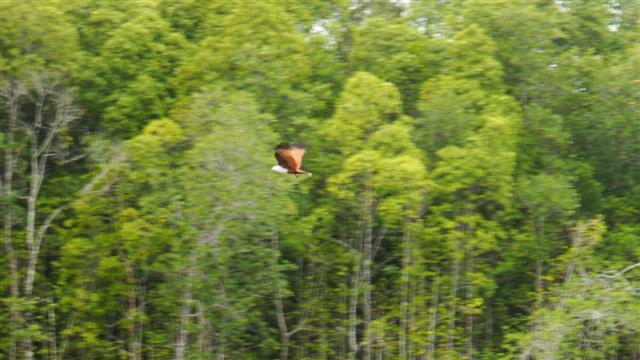 Some were soaring high up in the mountains but some were swooping down on the fish that the tourist boats had attracted by feeding them. I’ve got so many photos with half a wing or a bit of a splash but this one has no less than 5 birds in it although they are difficult to spot. We motored back towards the boats but decided to cross over the ‘crossroads’ and see what was the other way. 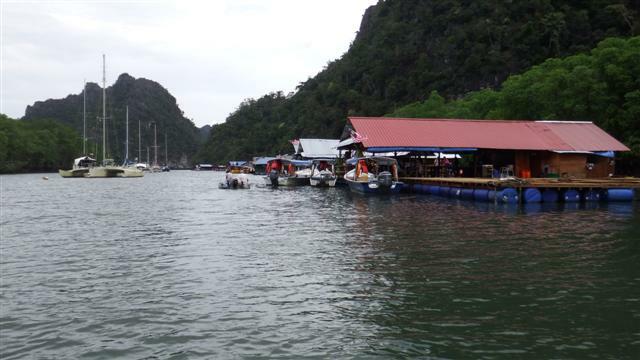 Just around the corner from where the boats were anchored was a row of fish farms with restaurants attached to them and mooring for boats. 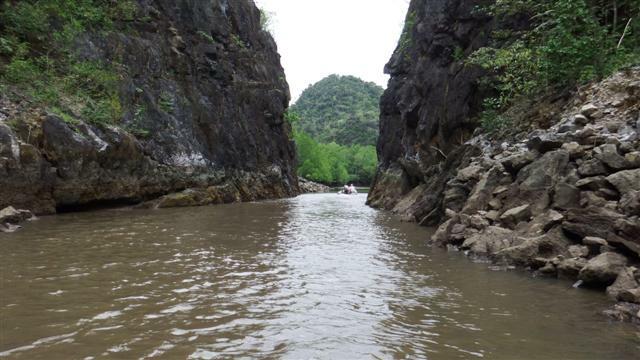 We should have ventured further up the river when we arrived. Continuing further up stream from the restaurants we stopped and tied the dinghies and while they slowly drifted we had our picnic. 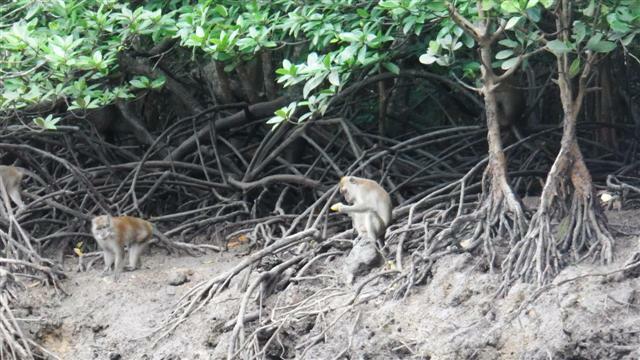 Even further upstream it started to shallow off but we spotted some monkeys on the bank. Unfortunately they saw us and started following us. One of the tourist boats warned us about letting them get onboard so we watched from a safe distance. The hole in the wall? We thought we had discovered the ‘Hole in the Wall’ when we came across this gap in the rock but a bit further round and we think this is the hole in the wall. 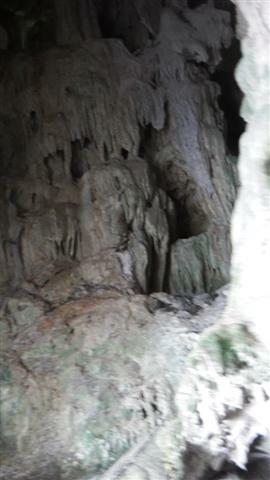 There were some lovely stalagmites inside. Later that evening we had planned to have a meal in one of the restaurants but the heavens opened and we had an absolute downpour for about an hour. As we had made it as far as Norsa it was decided to open another bottle of wine and wait for the rain to stop. Once it stopped we ventured out and had a really nice meal. The next day we left for Thailand. 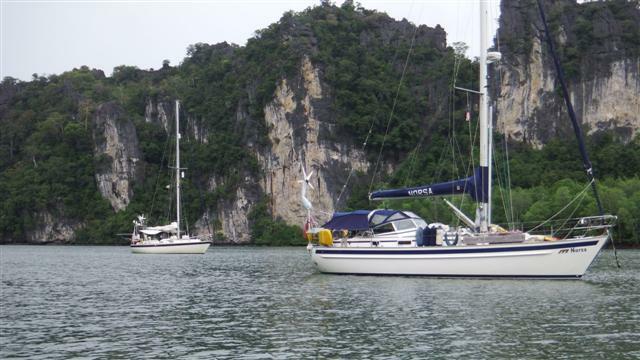 Posted on December 30, 2014, in Coastal cruising, Port posts and tagged Langkawi. Bookmark the permalink. Leave a comment.